For various reasons, more and more companies are hiring remotely and hiring contractors. It can save on insurance costs, office space costs, and can be a valuable incentive to employees. In many industries, the majority of the daily tasks are done on a computer, so this makes a lot of sense. However, having remote employees also brings in new challenges: lack of supervision, collaboration limitations, and lessened team chemistry. Hiring managers need to have an idea of who will thrive in a remote role and how to identify prospects that match that profile. 1. Are you willing to have periodic face to face meetings and conference calls? We live in a world where people would rather text than call and would rather email than discuss face to face – these alternatives can just be easier. But having periodic face to face or phone meetings are important in establishing a more personable relationship with remote employees and focusing on priorities. Despite the distance, trust can still be built and team chemistry can still be strengthened. These are essential elements in running a successful business, whether it be remote or in-house. 2. How do you stay organized and prioritize tasks? Getting to this level of detail is more important than you think. You have a right to know their methodology for staying organized and focusing on priorities. You unavoidably lose some accountability with employees who work off-site. However, if you use project management tools, such as Producteev or Teambox, and have transparency in your work-flow, then accountability can still help drive production. Find out how they use email and how they prioritize tasks and set goals. You need to feel confident that they’ll be able to stay efficient and understand the importance of accountability. 3. Do you have a dedicated home office? With all the distractions that can go on at home – this is an important one. It can be hard to accomplish much on a conference call if kids are screaming and dogs are barking. Make sure they have an isolated area in their home where they can focus on work. Having a stable internet connection, an adequate computer, a printer, and other work related tools are a necessity. Working remotely can be a great arrangement for both the employer and employee, but only for the individuals that are the right fit. 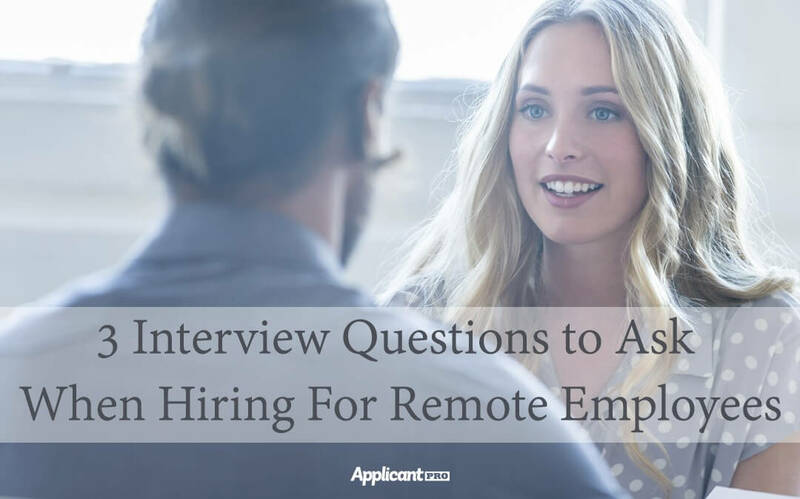 Make sure you ask the right questions and you’ll be able to hire remote all-stars.